Frito-Lay adding 0 Grams Trans Fats message to Tostitos products. There's a link for more. Take the link, and here's what you get. In the coming months, the "0 grams trans fat" message will appear on other Frito-Lay snacks including Lay's, Ruffles, Doritos, Fritos and Cheetos. "Consumers today are becoming increasingly aware of foods containing trans fats," said Stephen Quinn, chief marketing officer, Frito-Lay. 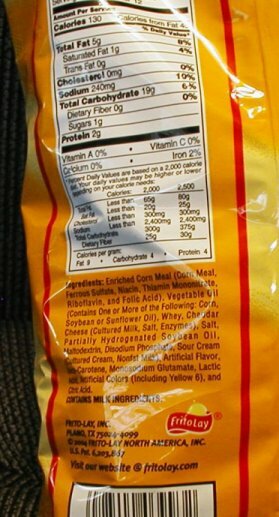 "Frito-Lay is now adding the '0 grams trans fat' message on the front of the bag to help consumers make informed snacking choices." Back up a bit before I get into why I'm writing this. Trans fats are created by hydrogenation, and they were at the supposed healthier alternative to saturated fat. You know it as margarine versus butter. But they're not the most natural thing, and debate has sometimes swayed the opposite and stood in the corner with butter (if one must partake). So, if consumers are to be concerned - and they should be. WebMD and others agree that there's no known "safe" intake amount of trans fats, would you not want to avoid them at all - or almost at all - if given the choice? The answer to this also appears to be yes - trans fat content will appear on nutrition labels in 2006, by law. Many companies are jumping the gun on this - affixing proud labels to their pristine products. Frito-Lay's not the exception. But it's not telling the whole story. Zero grams doesn't mean none. How does one currently identify trans fats within a packaged product? Well, companies such as Frito-Lay who are meeting the requirement early put the number of grams within the nutrition label. But, as I stated, this isn't everything. You read the nutrition label and stop, and you figure "none." You read the ingredients, however, and the answer is "not exactly." The words "partially hydrogenated x oil" (x is often soybean) indicate the presence of trans fats? Check this out. Do you see it? I tried to leave the images big enough so that Partially Hydrogenated Soybean Oil stood out for you. Stinkers. They're making a big deal out of something that is true to labelling standards (less than .5 grams) but doesn't satisfy me, the one who's trying to make the label-mentioned "Smart Choice." Tostitos bags say the same thing but truly have 0 grams - no mention of hydrogenation. How much trans fat is safe? No one really knows. Kava says that the prestigious Institute of Medicine reported that there isn't enough research yet to recommend a safe amount of trans fats. "We know that like saturated fats, trans fats can raise bad cholesterol but there is conflicting data about what it does to good cholesterol," she says. "I wish the data were stronger." The FDA, while requiring manufacturers to put the amount of trans fats on nutrition labels, will not require a % daily value (DV) for trans fat because there is not enough information at this time to establish a such a value, she says. Food labels do offer such information about saturated fats. Nabisco Wheat Thins completely removed this type of fats from the product. The result? Crunches just a bit different, but still very tasty. 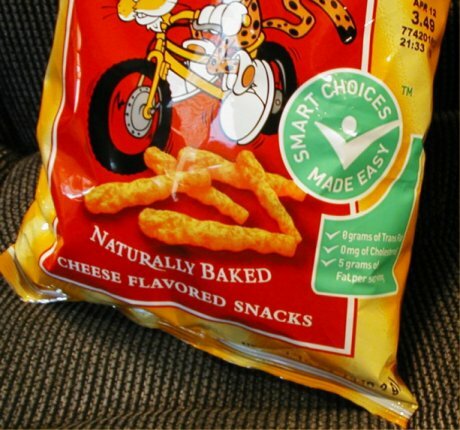 Its advertising claim is also 0 grams trans fat. And it's not kidding. hln Just thought I'd bring it up.